NOTE: The post following this one retracts/corrects someof the things covered below. Many have noted that the wech-o-meter (Tremor location display) has been locating tremor most days over the past month in central Puget Sound and have been curious why we don't think this is a real Episodic Tremor and Slip (ETS) event. In a previous post Mouse Reusch questions whether this is a real ETS or not and suggests that it is not. I agree and support my opinion with the following three observations. The tremor is too weak. There is no obvious geodetic component. However, science is messy and different people may interpret things differently. See the alternative interpretation by Aaron Wech (of the "wech-o-meter") near the end of this post. 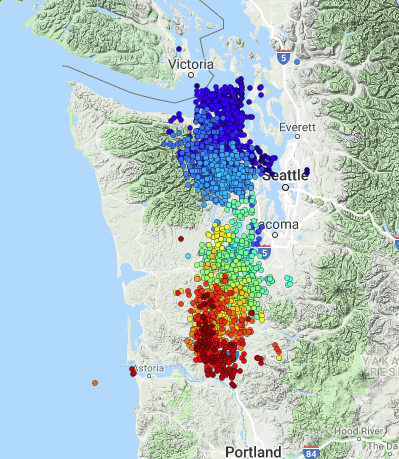 Below is a plot of the wech-o-meter tremor location in Washington for the period, March 9 - April 7, 2019 color coded by time (blue earliest, red latest). Note that this period begins with tremor in the north and down-dip (east), progresses up-dip and then to the south with a bit of a gap around the latitude of south Seattle. Main ETS events of the past mostly migrate to the north; however some have had, at least some migration to the south similar to this. See the comparison maps and in particular the end part of the fall 2012 event. We don't feel that the migration direction is significant one way or another. Perhaps it being divided into two separate areas of concentration may be significant. Here I will discuss these three observations in detail. For the past 20 years the inter-ETS time for the northern Washington ETS has been 12-14 months and has never been less than 11 months. The last central Puget Sound ETS started on May 9 of last year and migrated northward. There was a pause of almost a month before it continued (or a related ETS started) on Vancouver Island and ultimately filled the gap. Of course, things could change with a significantly early ETS, but we think this is not currently the case. Latitude between 47 and 49: There is one event further north (49.9) that is left out of this catalog. Must be at east 150 Hours: Selected so I can call the current period (which now has 171 hours) as similar. It also means we can include the 2005 ETS, which was real, but small number of hours because small number of stations and lousy distribution. The timing of ETS is defined as the mean time of all the tremor epicenters. ETS latitude is the mean of the tremor latitudes. The time between the current “ETS” and the one before is 8.6 months. The next shortest intervals are 11.7, 11.9, 12.2, 13.1, 13.4 months. If we do not count the current event, the mean and standard deviation of time intervals are 13.96 +/- 1.57 months. This result of Dr. Creager's is similar to my more qualitative estimate of inter-event times based on when I think an event starts. Thus we both think the timing of this is inconsistent with the classical ETS event. One thing the current wech-o-meter doesn't make easy to visualize is the strength of the tremor, that is the amplitude of the waveforms. (A new, revised wech-o-meter is in the works that will help with this. Stay tuned for more on this later). Currently tremor is located and plotted if the location algorithm gets enough consistent cross-correlations independent of the strength of the signal envelopes. 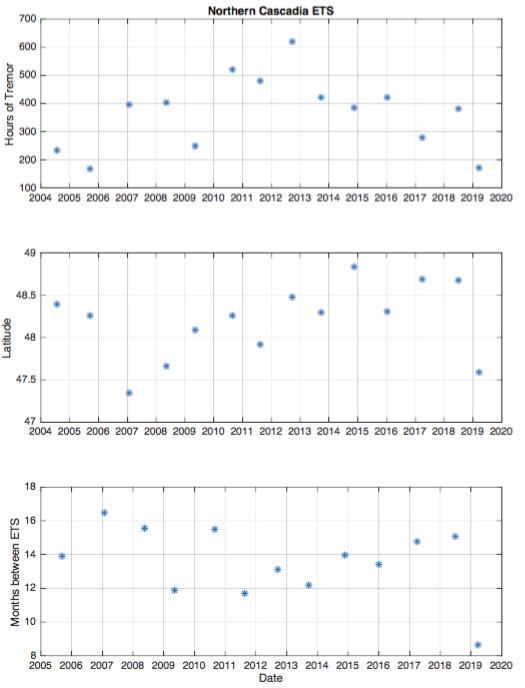 Below I compare a sample set of envelope plots during the recent tremor period with one from a previous, real ETS event. 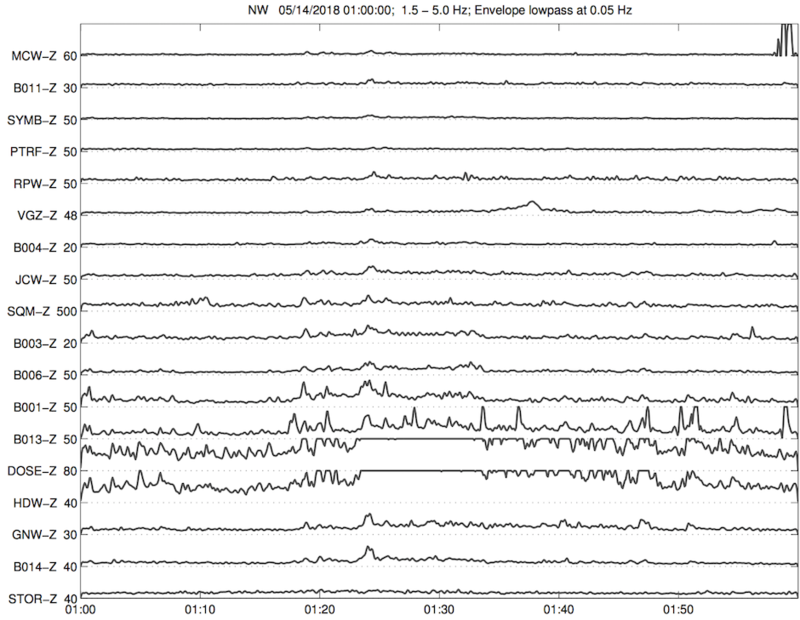 In both cases the wech-o-meter located several tremor events during the plotted hour. Above is a recent hour's envelope. Note that the amplitudes are only significant on stations B013, DOSE, HDW and GNW and are weak on other stations. Below is an hour's envelope during the spring ETS last year for events in the same loaction. Note that the same stations have a larger signal, and the event is very well recorded on many more stations. BTW, traces with a flat top are where the plot has been truncated so as to not overlap other traces. The signals are much bigger. The above is just an example and while not quantitative the amplitude differences are consistent with a visual review of many envelope plots during different time periods and tremor locations. The final, and perhaps strongest piece of evidence is the lack of any obvious geodetic signal, i.e. evidence of significant slip. While I am not a geodesist I think it is not rocket science to compare displacement traces over the past two years and see when there is obviously slip and when there is not. Below I show 2-year plots for 2 geodetic stations in north Puget Sound followed by a plot of 2 stations just south of Puget Sound. In each case there are obvious slip events seen in the traces. In the first case displacement starts in mid-May, 2018 and lasts about two weeks, just the time that tremor during last spring's ETS was strongest in north Puget Sound. In the second case displacement starts in early to mid-January, 2018 and ends 2 weeks later. This is the time period when the central Oregon ETS was just finishing up after spreading north, up through southern Washington. In both plots, looking at the ends of the traces, there are no hints of unusual displacements, thus no detectible slip during the past month. I guess my main comment is that I struggle with the premise of this question more generally. "Is this the real ETS?" Tremor is happening, and quite a lot of it. And we know that tremor means slip is occurring. So regardless of the size of any geodetic signal, this is a tremor and slip event. Given that something similar occurred both in 2017 and 2018, one could even make the case that it's episodic. I don't think propagation direction has much significance in defining the size of a tremor/slip event, but it does reflect some of the complex slip history at the plate boundary. ETS vs. inter-ETS activity makes some sense when looking at a particular point or small area, but it gets trickier when looking at larger areas along strike. I don't like the distinction between ETS and non-ETS. I prefer to think about the slip budget at each portion of the fault. But if forced to use these binary terms, it seems to me that the Southern Washington activity is that patch's ETS. The Puget Sound / N. Washington activity may or may not be. I do expect more slip to occur in North Washington and propagate north, but I also kind of expect that slip to begin and extend north of what has already slipped (i.e. starting near the Strait and migrating beneath Vancouver Island). If that's the case, does that mean that the activity that already occurred in Puget Sound was that fault patch's ETS (i.e. it has no more slip deficit)? Maybe. Do we expect more slip in the coming months to occur in N. Washington and/or Vancouver Island? Yes. Do we expect more slip in the coming months to occur in N. Puget Sound? Possibly. Do we expect more slip in the coming months to occur in S. Washington. Probably not. Thus Aaron takes a different view and looks at the whole zone as more of a continuum rather than a defined "classical northern Washington ETS". I am concerned about his assertion that "And we know that tremor means slip is occurring". Indeed, most scientist think that tremor is a result of slip. However, in this case it is either not occurring or is too small to be obvious, unlike previous ETS events in this area. There is no question that there has been significant tremor and that it has migrated in a fashion similar to that of a classical ETS (~ 10 km/day north to south in this case). So what is going on? Drs Creager and Crowell (a real geodesist) agree that this is not a classical ETS with obvious slip but is a longer period of inter-ETS tremor than is usual. There are other cases of extended tremor without obvious geodetic displacements in the past but none that has lasted this long. But there is no reason that longer periods of inter-ETS tremor are excluded just as having such tremor scattered all over Cascadia at the same time is not without precident. The more data we collect the more different ways this sort of activity seems to manifest itself. Isn't science wonderful. Previous studies by real geodesists have found that the total moment of a slip event (~ area * displacement modeled from geodetic data) is roughly proportional to the duration of the tremor associated with it. This may not be the case here. 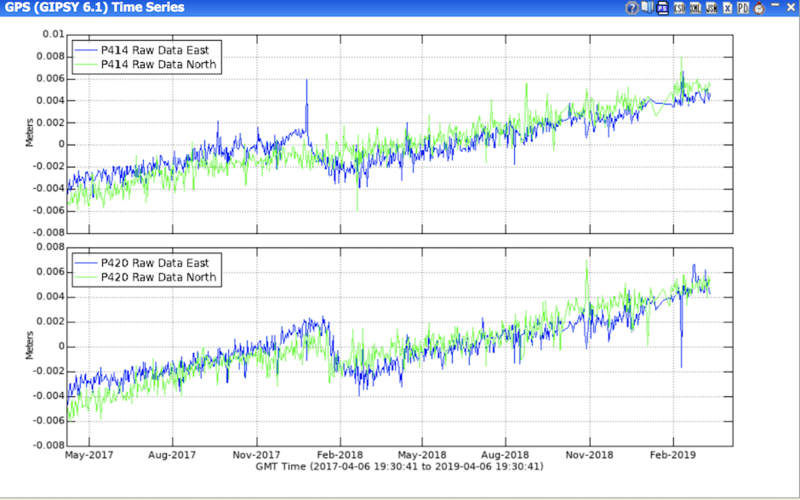 My guess is that if a real geodesist were to do their magic using all (or many) GPS stations they might detect one or possibly two small slip event during the past month but no where near large enough to be similar to the regular 14 month one we have been episodically seeing for 20 years. Therefore we might call this current situation an "eTs" (small 'E' and small 'S') event for not very episodic nor having much if any slip. However, Dr. Wech's argument over the semantics of a binary definition (real ETS or not) may be more appropriate. 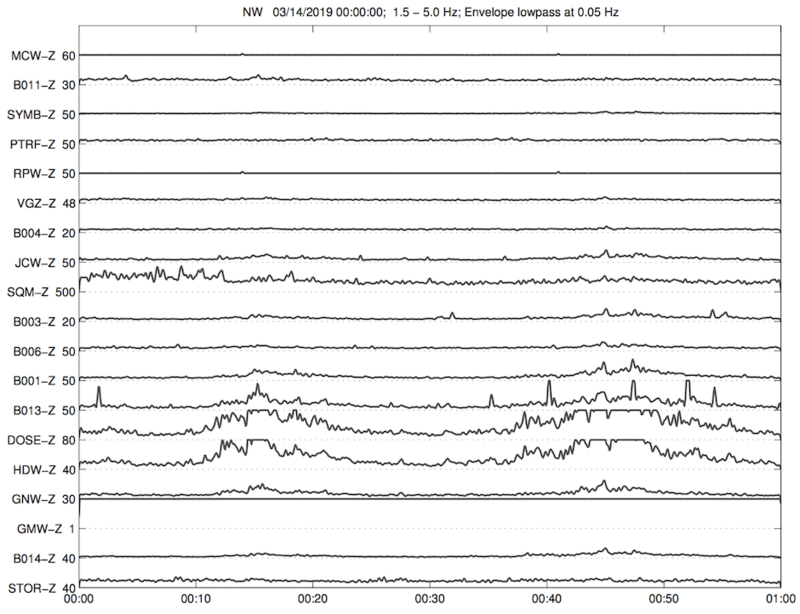 So, what is the significance of this non-ETS tremor period? Does it mean that large real earthquakes are more or perhaps less likely? Who knows? It likely has little or no significance related to earthquake hazards but at this point we don’t know. There has been a hypothesis around for some time that during ETS events there is a slight increased likelihood of a subduction zone, mega-thrust type earthquake due to the down-dip, slow slip of the ETS increasing stress on the up-dip, locked portion of the fault. However, this in only a theoretical hypothesis. Thus far there is no real data to back up such a hypothesis. Unfortunately there is no reliable way to predict earthquakes. 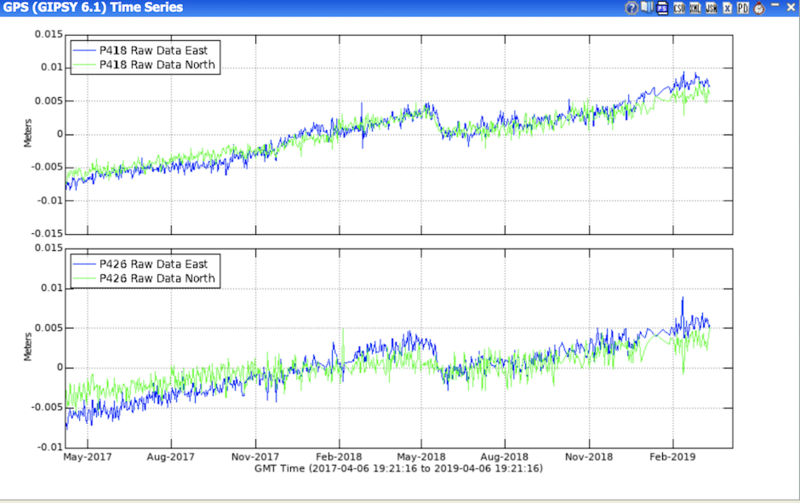 Perhaps in the future with lots more data we will be able to draw a connection between ETS events and major earthquakes but at this point any connection is no more than a hypothesis. Thus earthquake preparedness should be an ongoing concern not influenced by ETS events or the lack thereof. In anticipation of a classical ETS getting going this summer I have started a tremor-log page for the ETS event of summer 2019. There is not much there yet but I will update it as the summer progresses.